The nuggets and I have finally ventured into a new Big Idea in math. We've waded through place value and double and triple addition and subtraction with regrouping which felt like a slow climb up a roller coaster and now we're enjoying the fun ride downhill. Seriously, after struggling with chapters that ranged from ridiculously easy (which I'm not allowed to skip over) to chapters and questions so hard I actually had kids in tears, moving into measurement feels like a breeze! Math is fun again, yay! We've been using our rulers and handmade yardsticks (directions and pix HERE) to measure all kinds of things all over the school. Even after we really understood how to use a ruler and got an idea of the length of an inch and a foot, we still had some trouble deciding when to use each one. So, of course I made a game to practice! 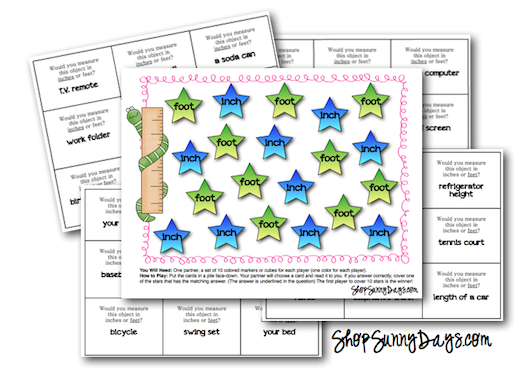 In this game students play in pairs and decide whether they should use inches or feet to measure a given object like a newborn baby or length of a car. Directions for play are listed right on the game board. Click on the pic to download your free copy from Teachers Pay Teachers. Thanks so much to those of you who have already stumbled upon it and took the time to leave a sweet comment! Turns out that a few of my blog buds also had some great measurement freebies to share, so check out the links below to visit them and grab some more great goodies! thanks for the great links and your measurement unit, I can't wait to use them. I love your blog and all the great ideas and links your post. We just left you an award! Your blog has some really good ideas. I really liked the inferencing ideas that you shared from FCRR. You have some great resources on your TPT store, too! Giveaway Monday Sponsored by Learning Resources!